Many teachers have long been frustrated with static, canned curriculum that doesn’t seem connected to kids' lives, and testing requirements that drive the learning experience. So they, often in partnership with daring leaders, are pushing back, trying to find ways to meet the long-held goal of educators: Meeting each student’s needs and helping all to be successful. Three main ways schools are attempting this work are through technology use, an emphasis on personalizing learning and moving toward a mastery-based or competency-based evaluation system. While not all the same, these approaches share some commonalities and require significant structural changes to the education system if they are to be implemented well. The report defines personalized learning as “tailor[ing] learning to students’ strengths, needs, interests and experiences.” The authors are careful to point out that adaptive learning software that allows self-paced learning is not the same thing as personalized learning. Good teachers are crucial to help students identify their learning strengths and weaknesses, to offer various learning modalities and to push students to apply their learning to their personal interests. No two students are the same, and a personalized model recognizes the same tools and approaches won’t be appropriate for every student. Competency education refers to a break from the traditional time-based school model. Rather than moving students on to the next grade with their age-based cohort, regardless of gaps in their foundational knowledge, educators allow students to move on only when they have demonstrated mastery of topics. This can lead to a chaotic classroom, with students at many different stages in their learning, which is partly why many competency-based schools rely on technology to help meet students' varied needs along the way. “If we just keep doing what we’re doing today, we are still going to end up with kids with huge gaps, even if they advance incrementally,” said Susan Patrick, president and CEO of the International Association for K-12 Online Learning (iNACOL) and co-author of the report. 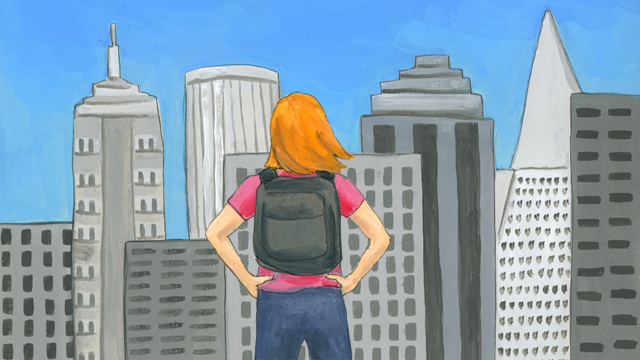 She notes that some critics of competency education worry it will widen opportunity gaps as advanced students move quickly ahead, leaving struggling students even further behind. Patrick says that shouldn’t happen if teachers hold all students to high standards and make sure to examine data on student learning every day. “In a competency-based system you have to know where every student is when they come in, be honest about that and address those learning gaps,” Patrick said. She doesn’t believe that it works to rely exclusively on technology to help students catch up. Too often digital tools are used to drill struggling students and get them “back on track.” But without opportunities to research, analyze and apply learning, those students are not being given the same chance to dive deeply into their learning, part of a good personalized program. Transformation of this kind requires a special kind of leader, one that our current training programs aren’t producing. While there are many excellent leaders in education, they have often picked up their adaptive leadership qualities on their own, out of necessity. “You are talking about a whole significant, complex transformation of the system, from being one around time -- which is quite frankly easier to manage -- to one that is around learning and meeting every student’s needs,” Patrick said. That takes a clear long-term vision and the ability to plan five to 10 years ahead. During a transformation of this magnitude, even the best-laid plans shift, challenges arise and adjustments will be needed. The change leader has to manage every eventuality as it pops up, while being careful not to do so in a top-down way. For this kind of transformation to work, leaders have to work cooperatively with everyone in the school and broader community. Often districts start the communication and outreach process three years before implementing a plan. This step is easy to overlook, but is crucial to success. Teachers, parents and students are at the core of the education system, and if they aren’t co-designers of the process it won’t succeed. “The goal should be to create a shared understanding of why change is needed, what parents and community members want for their children, and how district leaders can work together to build a shared purpose for all stakeholders,” the report notes. That requires districts to engage often and transparently. Since this work is still quite new, one of the strongest assets innovative leaders have is one another. Strong professional learning communities, with exemplars of what has worked and even observation of one another’s progress, can help move the work forward. Leaders should be given credit for finding their own professional learning opportunities, especially since there is so little formally recognized training that teaches leaders how to be catalysts for whole-system transformation. “There is a real lack of knowledge of how much this is holding back the education leaders who are leading competency-based models,” Patrick said. Some district leaders are even running two parallel accountability models, one to satisfy federal and state testing requirements and another that fits with their competency-based model. That takes resources and time, which are both in short supply. 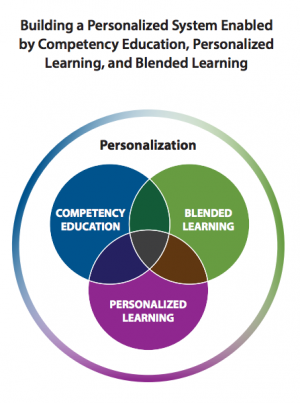 From the CompetencyWorks report, "Maximizing Competency Education and Blended Learning: Insights from Experts." “You start to really see how, in the broader system, issues are frozen into place,” Patrick said. “We need new structures that are competency-based and personalized.” She points to the fact that state and federal accountability measures are predicated on the time-based, age-cohort model of teaching common for over a century. It offers little flexibility to districts trying to meet the needs of today’s students. Patrick would like to see modular assessment offered at public libraries. Rather than taking one point-in-time standardized test meant to encapsulate all a student has learned in a year, students would take a test at the end of each module, whenever they finish it. “Then you are actually aligning the accountability system to student-centered learning,” Patrick said. The modular accountability system Patrick suggests would offer a way for students to show their growth. Right now, if a ninth-grade teacher has a student who comes in at a fourth-grade reading level and she helps him improve to a sixth-grade reading level, he still performs poorly on the ninth-grade test. She gets no credit for the growth she helped that student achieve. “The accountability system right now is getting in the way of what’s right for kids,” Patrick said. Teachers have always wanted to provide their students with individualized support, but they often haven’t had the resources to accomplish that goal. Now technology can help by offering a diverse set of tools to be used when appropriate. Technology has the potential to help schools break away from a time-based model and give teachers insights into student understanding. While not a silver bullet, and ineffective in the hands of a teacher without a plan, when the right tech tool is used at the right time with the right student, it can support mastery for every student.